By the age of 12, Aaliyah Dana Houghton hit the big time. Her uncle Barry Hankerson, an entertainment lawyer formerly married to Gladys Knight, secured a distribution deal at Jive Records for his Blackground Records label – and signed his niece to a record deal. Hankerson introduced Aaliyah to R. Kelly, the hottest new R&B star on the scene, who was taken with her voice after hearing her sing a cappella. Thirteen years her senior, Kelly positioned himself as a mentor, guiding his protégée to success, becoming the sole songwriter and producer of her 1994 debut album, Age Ain’t Nothing but a Number. As soon as the album dropped rumours began to swirl. Talk of a secret marriage between Aaliyah and R. Kelly was everywhere. Both artists denied the allegations and it would be some time before Vibe magazine unearthed their Illinois marriage license issued in 1994, in which the 15-year-old singer gave the age of 18 for the certificate. The pair denied the allegations, while her parents arranged to have the marriage annulled in 1995. Aaliyah then severed all communication with Kelly and had all records of the marriage expunged. The scandal of a secret marriage did not dampen Aaliyah’s debut. Her first single, “Back and Forth” went to number one on the R&B/hip hop chart and number 5 on the pop chart, with Madonna taking notice and sampling it for a track on Bedtime Stories, released just a few months later. In the years since Aaliyah’s death, she continues to be the subject of intense fascination. We look back for clues of who this enigmatic artist truly was in the music, the videos, the films, the photographs, and the stories she left behind. 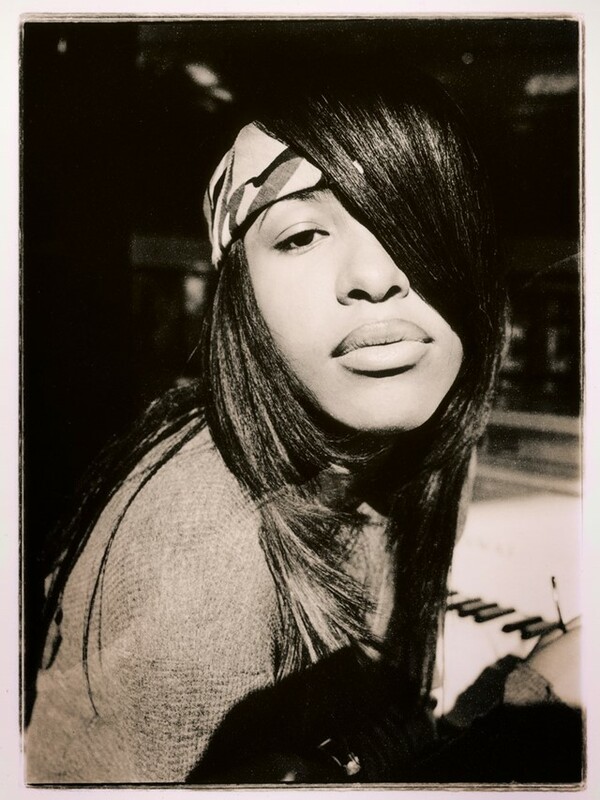 British photographer Eddie OTCHERE first crossed paths with Aaliyah in London in 1994, while in his second year of studying photography at the London College of Communication. Like Aaliyah, OTCHERE was at the start of his career – and now his time with Aaliyah can be seen in the new book Contact High: A Visual History of Hip-Hop by Vikki Tobak (Clarkson Potter), which presents four decades of iconic photo shoots. 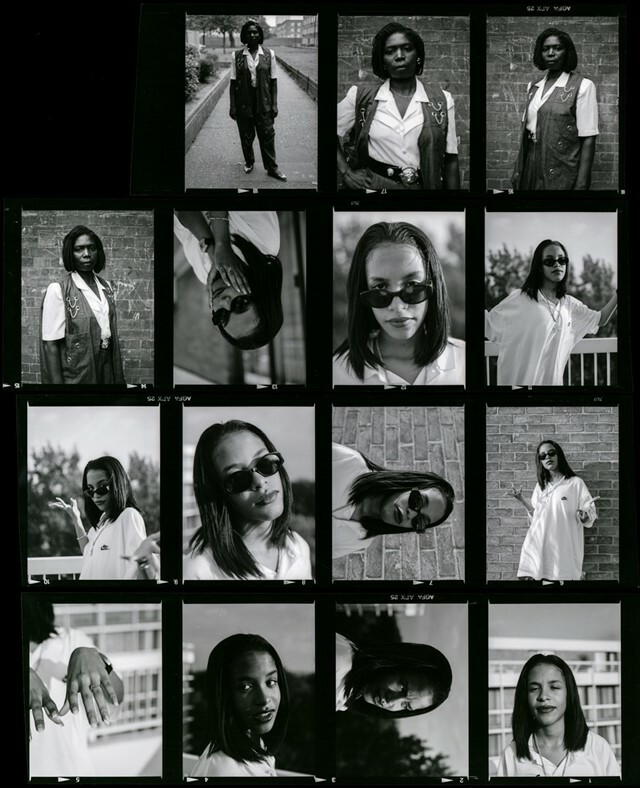 Here, OTCHERE shares what it was like to photograph Aaliyah at her very start. Eddie OTCHERE: “Aaliyah was in town for a junket for her album; she was just another pop act on Jive Records but she always had that voice. The shoot happened at a hotel in Swiss Cottage. It was me and my mate Andrew Green. We lived locally together and tag teamed these shoots together. He would do the story and I would do the pictures – that was our thing. We were doing the story for Touch magazine; they didn’t really want to run it because they saw her as a nominal pop act. I’m not sure if they ran the story; they might have but I have no real memory of it. “I would shoot people I liked back then. I collected records back then (still do now), and I would shoot someone who was on my radar that I would love to meet. The controversy started in regards to R Kelly, and I wanted to get a measure of her and meet this quite young girl who struck me because whenever she would ‘um’ and ‘ah’, it would always be in key. That’s now become my measure of an artist. “Andrew and I had just got back from New York that summer, so we had become used to the oversized look oversized look Aaliyah had on. I noticed she had that Tasmanian Devil chain on, the same one R. Kelly had. I also photographed her hand, which seemed to have a wedding band on it. I thought it was quite interesting with the rumour of a secret marriage. “She was groomed like a pop star and was very well versed in terms of the professional conversation that needs to be had, but once she got the script out of the way, she could be herself. I got the feeling she was uncomfortable around adults, but was comfortable around her own peers. We were relatively the same age; I think we were three years older. “Aaliyah was much cooler when we were on the balcony, the three of us by ourselves. Which is why when I did the second shoot at the hotel, I asked her to come downstairs and meet me at reception, so we could hang out. It was just us and we shot by the piano. “We went back up to the room, and I pinned up a cloth, an African fabric I took from my mum’s archive. With that sort of semi-studio vibe, she could relax and be playful. She was good with the camera, comfortable with herself, completely working it. She was enjoying the journey – to tell her own story and speak about her artistry. You could sense that straight away: her whole sense of performing, acting, and behaving in front of the camera. She was very generous. “The first time around, she had that hip hop swagger, her head slightly tilted back, the big glasses. They were genuine looks. If you look at the contact sheets, I shot Ice-T earlier, and he has his own thing, which was strictly LA. What was nice about America then is how regional regions were; they probably are now to a certain extent but the general joke is all New Yorkers wear Timberlands. “A conversation that Contact High brought into play is how the contact sheet is essentially a linear narrative. One picture after another, in real time moving forward, it’s the way we experience time. When Vicki gave me the book, I said, “Thank you”, then saw there’s a picture of my mum in the book, because that’s how it worked out. I must have finished off the film when I got home, and asked my mum to stand there for a few shots so I could finish the roll, process it, and have it ready. Bang, bang, bang – and history. “I named my daughter Aliyah and my second daughter Erykah – so you can guess who she’s named after. After Aaliyah, after hearing that voice in key, that was it for me. I thought the beauty of song is what Aaliyah brought into the world and I definitely wanted that for my daughter to (and if your name has A at the beginning, you’re the in front of the queue in English schools). I would like to give a shout out to my daughter Aliyah, who is doing very well as a photographer, currently on tour with Raye and getting more jobs than I do.